With this beautiful barbeque caddie, you'll never worry about dropping your burgers on the ground again! Make this nice caddy for any occasion. This attractive, yet easy to build, project makes a great Christmas present. Deliver it filled with food, wine, candy or use your imagination. Last week we made the napkin holder for those upcoming outdoor picnics. Continuing on with that theme this week we will make a Picnic Caddy. 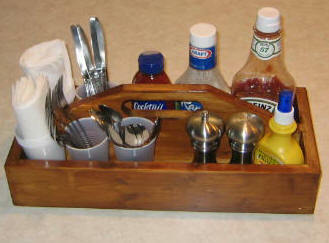 It is a handy caddy to carry all your picnic supplies to the table. Surprise your sweetheart with this easy to make wine glass holder. It will only take an hour or so to complete and the included full size template will make it even easier.